Since I have been reading more about the style and the history of the beer, I thought I would post this Saison recipe. Bière de saison looks to be the original homebrewer’s beer. 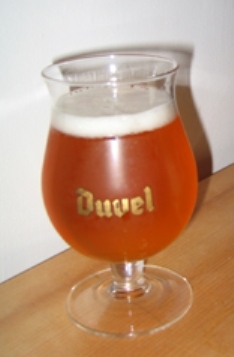 It is a style that comes from the beers farmers would brew in the French speaking part of Belgium known as Wallonia. Because the beers were brewed by different farmers, the style is hard to characterize. I think that’s great. It gives us more freedom to create interesting beers. BYO had a great article on the style by Horst Dornbusch, which I read and drew up this recipe based on his thoughts and techniques that he presented in the magazine. The big tip that I got out of it was that spices could be added to this beer, but Horst’s thoughts were to try to get a good Saison spicy flavor from the yeast and the hops. I am going to follow his lead. Fermentation will definitely be on the warmer side, probably in the 75 degree range. After primary, I will let it condition for a few months and pop one open in late spring/early summer. I think the main flavors you want to get out of this brew is spiciness from the hops and the yeast mixed with a tartness that is also coming from the yeast. Interesting note about the tartness, one of the most common statements I get from people who drink this beer is “I can’t believe there is no lemon in this beer.” after I answer their questions about the ingredients. With the high fermentation temperatures, you do get some nice spicy and sour flavors blending with each other. I have brewed this recipe a few times and have made slight modifications with each session. There are many different saison yeast strains available now so most of my experimentation has been with using different ones. I still like the WLP565 one the best. As long as you can get your temperatures over 80° F, towards the end of the fermentation, you should be able to finish with the gravity that you are targeting with this or any recipe you put together. Some say that this strain can stop working but I have never had that problem. Make a mighty starter before you brew and you should not have a problem with your beer. One disclaimer, I have never received an award in a homebrew competition for any saison I have submitted. Although the guidelines for this style are wide open, if your saison does not taste like the a Saison Dupont clone, I don’t think you are going to get too far with judges. Just my two cents but that should not stop you from brewing an excellent version of this awesome beer style. Hi John, I have a few questions for you. First, which month is the Saison article in in BYO? Second, could you tell me what your recipe is calculated for (boil volume, batch volume and brew house efficiency)? Lastly, I have Munich Malt readily availible but haven’t heard of “light” Munich malt. Could you explain any differences? I fell in love with this style of beer not too long ago and after a few failed brewing attempts (turned out to be ok beer, but not WOW beer), I picked up Farmhouse Ales. The article is in BYO’s December 2006 issue. 6 gallon boil volume for 5 gallon batch volume. 70% brew house efficiency. I used Beer Tools to create this recipe. It had light Munich malt as an option, but after some investigation, there doesn’t seem to be much difference between light or dark. It appears using any type of Munich malt will do. I will update the recipe to reflect this revelation. There is a difference in munich malts. Dark is typically 9-11LB in color while light municg is usually 3-6LB. Light is sometimes found as Vienna malt, depending on supplier. Its important to pay attention to lovibind ratings in recipes. For example chocolate malt can be found in ranges from 200 to 350. It makes a difference when trying to replicate a recipe. In terms of this recipe though, I don’t think it matters much since Saisons have pretty open guidelines. 1 oz. Styrian goldings at 30 min. Are these recipes, extract recipe’s, or all grain? I’m only an extract brewer at the moment but love Saison like no other. add ginger after flame is off at zero minutes and let steep for 10-15 min. with finishing hops before straining/transfer to fermenting vessel. the intense banana nose gives way to a mellow plum note after about 1month in the bottle. you could forgo the extra DME and the candi suger for a lighter result with even greater drinkability but the high-gravity version is very palateable with no ‘boozy’ or ‘hot’ chacteristics. I did a summer saison a number of years ago with a friend of mine. the brew day was a disaster as we were blessed with a stuck mash, but the beer tasted pretty good. I don’t recall the yeast we used, but I think it was some belgian yeast my friend provided. The beer required a lot of aging, but wound up being quite good. How did these recipes turn out? Planning to brew up this saison within the month. Our “Saison d’ Los Olivos” which we made last November (and it is still a WOW! beer) and which we are making again this weekend, so as to be ready for the October Grape Harvest. That looks like a great recipe. I used the WLP566 yeast strain. Had a great fermentation. Got down to my final gravity without too many problems. For 5 Gallon Extract recipie I use is 6 Pound Pilsner Malt 1 Pound DME and for yeast I use T-58 Dry Yeast. To begin with I steep a half pound of Viena . Also I use Golding for Bittering and Flavor and Saaz for Aroma. I use a pound of the clear candi rock sugar added about 20 minutes before the end. Recommend using a short boil 45 Minutes as a compromise to get decent hop utilization without carmelizing the wort.